Although today, AAPL is only worth 18.1 times DELL. Oh well. On the other hand, I’m pretty sure Icahn is not a very nice guy. I think he makes the Great White look like a fluffy kitten. Icahn is a shrewd businessman that made his millions (billions?) identifying poorly managed firms, that could prosper with new management. His loyalties are to the business and its prosperity (to the benefit of customers, employees, vendors and shareholders). 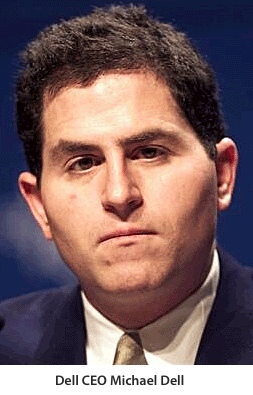 Icahn wants Dell and his management team out for very good reason. Under his leadership, DELL has declined to near bankruptcy over the last 10 years, making horrible acquisition and product decisions. The nicest thing that could happen to DELL, the Company, is for Icahn to prevail. Yep and the other real question is how do you go broke selling computers to the government? Inability to adapt and understand that was or is the problem for many….. Look at some CEOs of the [recent] past, Research in Motion, HP, etc. regarding PC and mobil industries. Microsoft?? Well, Microsoft is Microsoft…. for as long as it takes! You have to be exceptional during your sabbatical to execute a turnaround when you return…like Steve Jobs did. Michael, why don’t you take your own advice you gave Steve Jobs? I know, I know, I am piling on…like Michael did. That related articles list is the funniest thing ever. I love going back through some of those posts. You love the company DELL? The man Michael Dell? Or computers made by DELL? Before the rise of Intel MacBook Pros, I was forced to run workstation class laptops for 3D CAD and FEA mold flow analysis (which easily a half to hour long 100% CPU load run). My Dell laptop owning brother calls them ‘Smell’. Why the hell include Microsoft as part of the prospective list of investors? What does Microsoft bring to the table except boat loads of money? Microsoft has little to no appreciation of design or technological expertise. Because, IIRC, Dell is still the #1 (#2?) maker of Window boxes. So MS wants to be sure they keep making Window boxes, even if they don’t make any money.